Only yesterday I had emailed Philip bemoaning the fact that despite the relentless rain there was very little of interest around on the Fungi Front! Then today I ventured into an area of the wood I don't regularly visit (as it is not the most accessible) and came across a patch of these Earthstars. 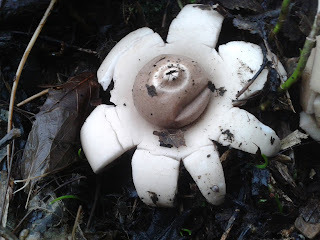 My first impression was that they were going to be the Collared Earthstar, but, as is clear in the photo they lacked the collar which gives the species it's name. Several books later, along with a session on the microscope, they had narrowed down to one of two species - Geastrum fimbriatum and Geastrum rufescens. Unfortunately, Buczacki and Michael Jordans' respective books vary as to the size that they give for the spores (mine fell between the two!). However in both instances the spores were significantly larger for G. rufescens than G. fimbriatum. This along with the fact that G.rufescens is several centimetres larger overall means I'm happy therefore (?) to plump for G.rufescens - The Rosy Earthstar. Very well done Tony. I did wonder which species of Geastrum as the 'opening', peristome did not seem right for either. Tony did microscopy of the capillitial threads (the gunge inside)and sent me photo. This fits with the species being G rufescens, a species I have never found. Excellent find!